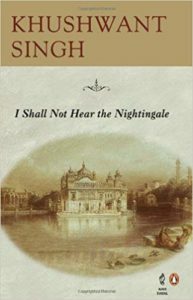 The latest addition to my website is Khushwant Singh‘s I Shall Not Hear the Nightingale. This novel is set in 1942-1943 in Amritsar. Buta Singh is the paterfamilias of a Sikh family and also the chief magistrate, the most important Indian official in the region, subordinate to the twenty-eight year old British Deputy Commissioner, Taylor, but very loyal to the British. Buta Singh’s son, Sher, and his friends, however, have acquired rifles and other weapons and are planning armed insurrection against the British. We follow the life of the Singh family but also the attempts by Sher’s group to become an organised resistance group. It all goes wrong when Sher is arrested, both for his family – Buta disowns him – and for him, as he is not the tough guy he thinks he is. It is an interesting snapshot of life in the Punjab when the British were not doing well in the war and the Indians were pushing for Independence.